For the first week of being on the ground in Haiti after the devastating 7.0-magnitude earthquake that leveled much of the country, staff with the NGO CARE, a leading humanitarian organization fighting global poverty, relied on only one functioning means of communication — text messaging — to coordinate relief efforts. “Texting has just been revolutionary in terms of how we’re communicating,” Rick Perera, press officer for CARE, told a group of Atlanta-area professional communicators a day before his return to earthquake-ravaged Haiti. Within a short time, CARE’s IT team had set up adequate IT infrastructure on the ground to enable volunteers and home staff to coordinate logistics easily over mobile phones and high-speed Internet. The relief work of CARE, working with corporate partners, has touched nearly 200,000 Haitians as of mid February. The need is immense, especially for shelter, clean water and o ther basic necessities. The toll from the quake has left more than 210,000 dead and 1.2 million people displaced. Joining Perera at the IABC Atlanta February luncheon was Delta Air Lines’ Frank Wrenn, who manages external affairs and communications for the world’s largest airline. Both shared their organizations’ role in the aftermath of the Jan. 12 earthquake, and how vital communications is in mobilizing and funding relief efforts. Delta, which has one Haitian employee who lost everything in the disaster, has flown five missions to the Caribbean island state, three under the US military and two to transport supplies, the news media and personnel from key NGOs such as CARE. Worldwide, Delta’s employees have raised funds to help Haitians, including supporting a new NGO, Yéle Haiti, a foundation started by Grammy-Award winning musician, producer and social entrepreneur Wyclef Jean. Employees raised $10,000 by buying t-shirts for the NGO. Groups of employees working overtime in a reservation center donated their overtime hours, which totaled $40,000, to the relief effort. “A lot of what we’re doing isn’t just financial, it’s about employee volunteerism, too,” says Wrenn. Delta’s corporate responsibility program, “Force for Doing Good,” allows employees to get involved in initiatives that support the company’s community outreach in four key areas –advancing global diversity, global wellness, improving the environment and performing arts and culture. A key priority at CARE is reaching the estimated 37,000 pregnant women in the earthquake zone by providing “safe-delivery kits” to midwives and o ther women in the community. It’s a tough challenge in a country that has one of the highest maternity mortality rates — 670 women die out of every 100,000 who give birth under normal circumstances. Awareness of the work of CARE among the general public in the U.S. remains low, notes Perera, who estimates that “unaided awareness” has gone from 3 percent up to 10 or 12 percent in recent years. CARE is trying to change that through storytelling and connecting with women in the United States. The organization has formed media partnerships with Meredith, publisher of women’s magazines such as Family Circle and Ladies’ Home Journal. CARE has begun to share stories of local Boy and Girl Scouts throughout the country who are helping CARE with relief efforts as a means to make sense of the tragedy and do something positive for their country. 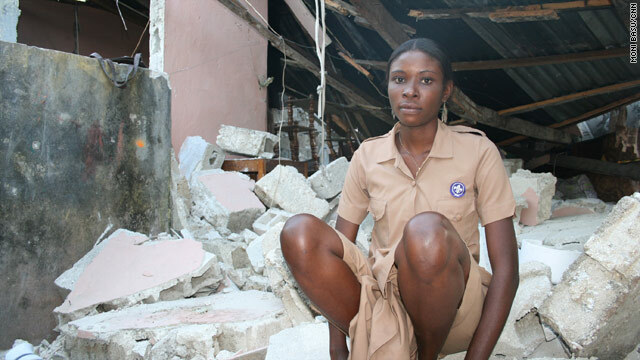 One Haitian Girl Scout, Joanie Ystin, barely escaped her home before it crumbled. She lives in Leogane, a city an hour from the capital that was at the epicenter of the earthquake. Her fa ther died in the rubble. She later found her Girl Scout uniform and joined in the volunteer efforts (her story is chronicled on CNN.com). According to Perera, 90 percent of the buildings in Leogane were destroyed. It’s a common corporate dilemma that many PR and communications staff must address – but in times of humanitarian need on the scale that we are seeing in Haiti, companies that are making a difference shouldn’t be reticent about sharing their efforts and lessons learned — not necessarily through a press release, but through o ther communications mechanisms (face to face, video, web, social networking). Personalizing these efforts through the eyes of real people – whe ther it be a Delta pilot who flew into Port au Prince or the volunteer spirit of a Girl Scout in Haiti — tell a powerful story that can influence and inspire, as well as enhance brand reputation and create broad-scale support. Communications and engagement should be the overwhelming priority. 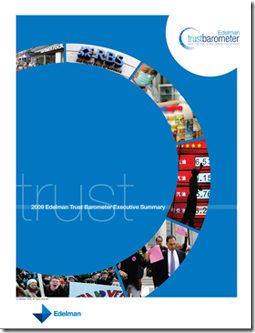 Not surprising, NGOs are the most trustworthy organizations, according to results of the 2010 Edelman Trust Barometer. In its 10th year, Edelman’s annual international study of opinion leaders aged 25 to 62 found that trust in U.S. business rose 18 percent while trust in the government remained stable. Technology remains the most trusted sector, while trust in the media continued its three-year decline, now ranking lowest of the four institutions studied. This entry was posted in Corporate Communication, Social Media Tips and tagged CARE, crisis communication, Haiti earthquake, Text messaging, using social media in humanitarian crisis on February 24, 2010 by AnneWainscott.